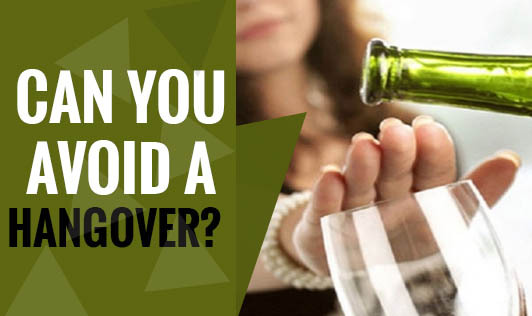 Can You Avoid A Hangover? • Avoid having alcohol on an empty stomach. Food soaks up the alcohol in your stomach and slows down its absorption. • Drink plenty of water along with the drinks. This will keep you hydrated, dilutes your drink and reduces the amount of alcohol that you have. • Avoid drinking more than 2 types of alcohol. Avoid cocktails since they have more than 2 types of alcohol. • Avoid dark coloured drinks. They worsen your hangover. Have light coloured drinks. • Strike up a conversation with someone while you are drinking. This will keep you busy, engaged and will prevent you from drinking too much. • Drink in moderation and know your limits. • Have high fat foods like nuts, oily fish, cheese etc before having alcohol. Drink sensibly and enjoy your party!